Beautiful beach front condo on the west end of St Croix in the gated and secure Harbour Beach Village complex. 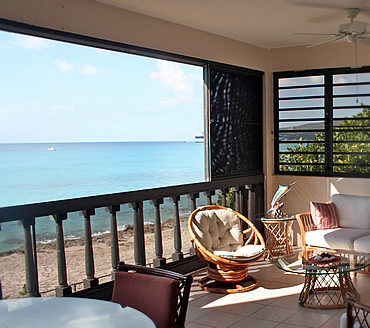 There are only 18 units in this small complex, which sits on the best beach on St Croix. World class snorkeling awaits you right outside the complex, and a great pool, pavilion, and lushly landscaped grounds. This immaculate one bedroom unit is on the second floor and comes with new appliances, fans, and is fully furnished. A separate laundry / storage room is perfect for those beach toys, and this one even comes with its own inflatable kayak. Monthly fees here are reasonable – only $475 a month. Automatic generator on premises. Self insured. $285,000.